Writing the words for a major museum gallery is like climbing a mountain. It is a dauntingly large task that can make even the strongest grow weary. It requires training, careful preparation, a good plan – and, I now know, it is altogether more joyous in good company. 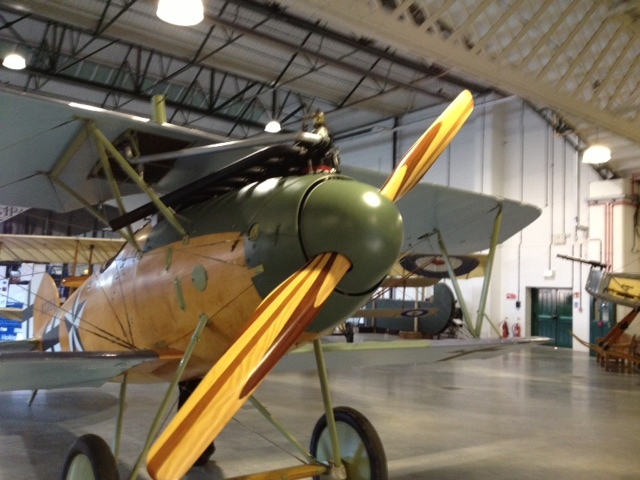 Sorry, I can’t tell you what this gorgeous plane is – go the Royal Air Force Museum and find out. I know less than very little about the early 20th century history of military aviation. It turns out to be extremely interesting – but that’s not why I am enjoying working at the Royal Air Force Museum so very much. I am helping a large team of writers work on a major new exhibition on ‘The World War in the Air’ that will open later this year. It is a hugely interesting project. It is exciting too – both the process and the content contain writing challenges. I led two training workshops on good practice in writing for museums to start the process. The first was held in-house, the second, at the Victoria and Albert Museum where I worked on a similar project over a decade ago. It was good to see at first hand how far the V&A’s approach to text writing has developed since then – and to see how far I had come too. Many thanks to the V& A, especially Lucy Trench, their expert and generous Interpretation Editor. Armed with that good example and furnished with an excellent and comprehensive Script Outline from exhibition designers Ralph Appelbaum Associates and a style guide and set of writer’s guidelines written by me, we were ready to go. I think it was important that after the training we asked who would like to do some the writing. Any trainer will tell you that people who want to learn new skills are gold dust. We struck solid gold: more than twenty people volunteered – about three times the number we had envisaged. Neither the Museum nor myself wanted to refuse anyone the chance to take part in what was becoming a real adventure. Instead we created 3 teams, each containing curatorial staff and education and outreach staff. We divided the writing tasks between the teams and I delivered what I hoped was a motivational speech. I was told later it was ‘very scary’. As I was talking about the dangers of procrastination for a writing project that is quite possible. I have many years’ experience. The teams set off. We waited for the first dispatch. I am by nature an optimist so my expectations are rarely exceeded. The staff at RAFM hugely exceeded them. Within a fortnight there was an avalanche of text, a fortnight later another. I suppose it was fairly obvious that twenty people can write ten times as much as two. Much of the work was very good and the teams reported that working on the text together had been enjoyable, productive and a very positive learning experience. Using team members as critical friends had been particularly successful. Good writers need good readers. Subject specialists and communications specialists worked together well. Between them they generated a strong collaborative spirit and a shared sense of responsibility for the gallery. I have found this a fantastically encouraging and energising project. 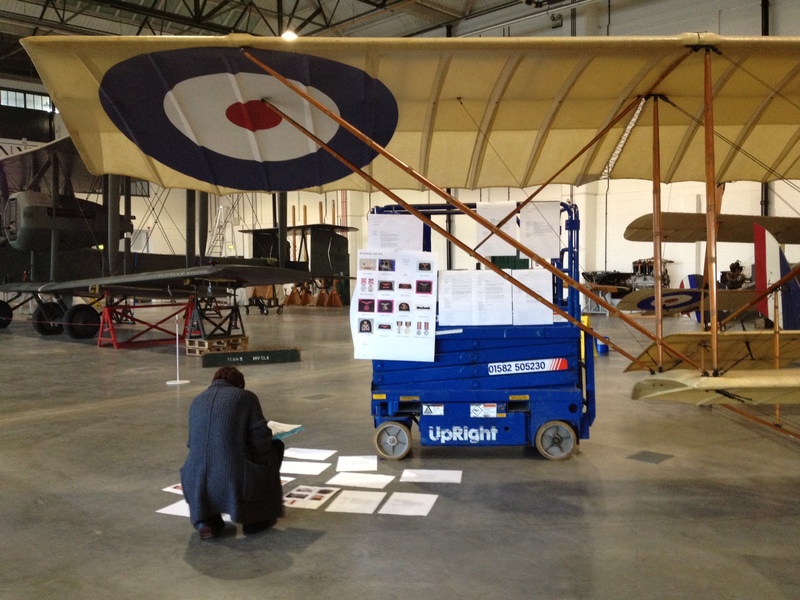 Working with the Royal Air Force Museum and its staff has been a great experience. Answers: Yes, good writers can be made (although I still think great writers are born) Yes writing skills are readily transferable to willing learners (like those at the Royal Air Force Museum). This entry was posted in Attractions, Training, Uncategorized, Writing and tagged aeroplanes, collaboration, exhibition text, exhibitions, First World War, Hendon, Ralph Appelbaum Associates, readers, Royal Air Force Museum, team-working, text-writing for museums, Victoria and Albert Museum, writers. Bookmark the permalink.